My Bamboo House Manufactured in Viet Nam by Bamboo Living Homes | Extraordinary, Balinese Inspired Bamboo House 2 Bed 3 Bath 2126 Sq Ft Plus Ohana on 5 Private Acres, Ocean View. 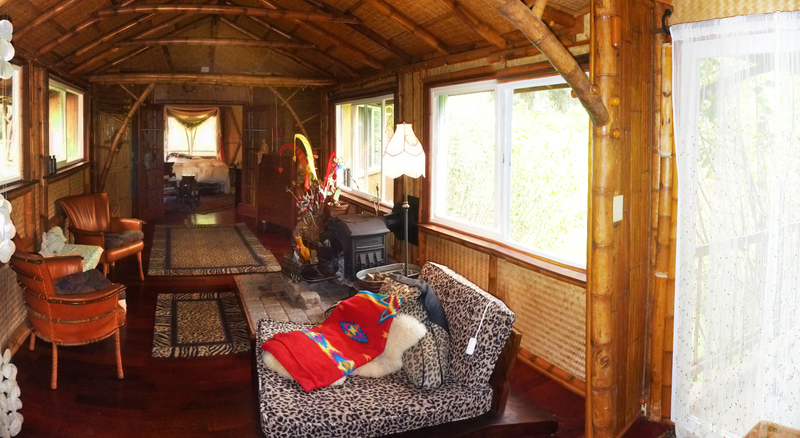 Extraordinary, Balinese Inspired Bamboo House 2 Bed 3 Bath 2126 Sq Ft Plus Ohana on 5 Private Acres, Ocean View. 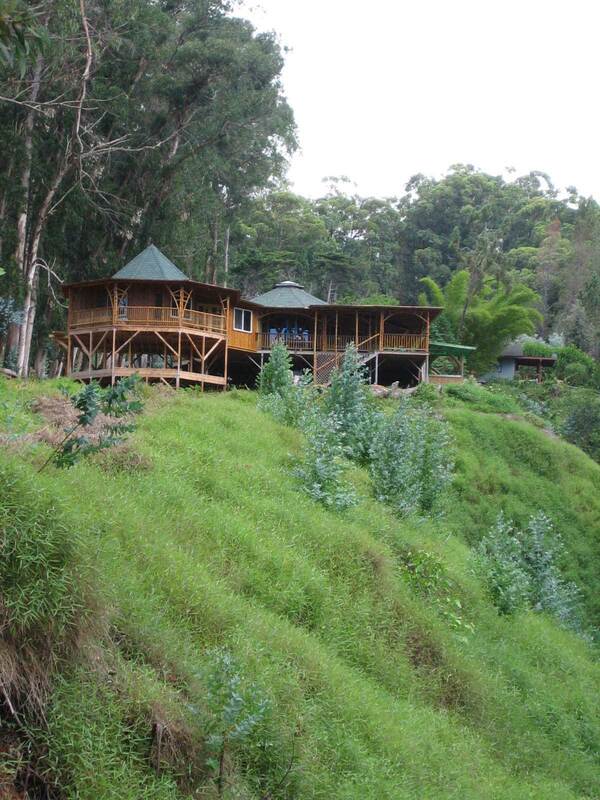 Upper Olinda has clear, crisp air, scented with eucalyptus. 5 acres stretch 1/4 mile between a conservation-zoned ravine and road. This luxurious bamboo sanctuary is testament to green building. You’ll feel the expansive design of the home with its dramatic roof line and graceful arches framing the extra wide decks. Made up of three round buildings connected via large enclosed breezeways each of which is it’s own special use area, perfect for entertaining. The exterior siding is split bamboo coated by Cetol for low maintenance. The 2 bed, 3 bath home is built like fine furniture; sturdy and beautiful. 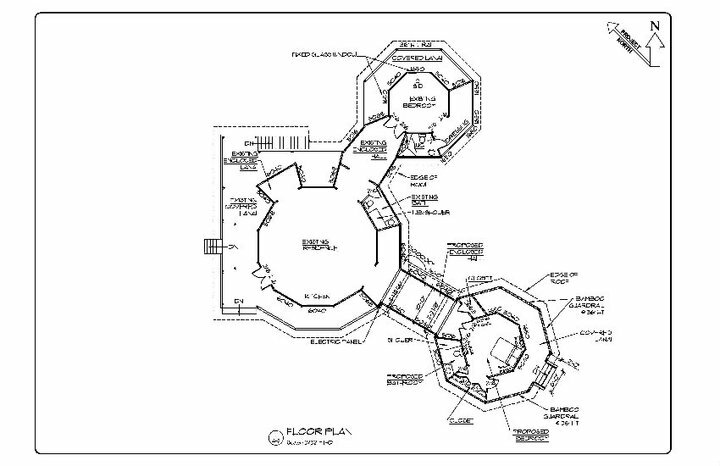 The main entry opens to 30’ octagonal great room with skylight, vaulted ceilings. The same honey tones are brought inside with cork flooring, bamboo framing and woven bamboo wall coverings. The kitchen is graced by monkeypod countertops, koa cabinets and high-end appliances. A cast iron wood stove warms on chilly nights. The house is surrounded by a 1200 sq.ft. covered lanai. A 633 sq.ft. partially-enclosed workshop could easily be converted to a 3rd bedroom. 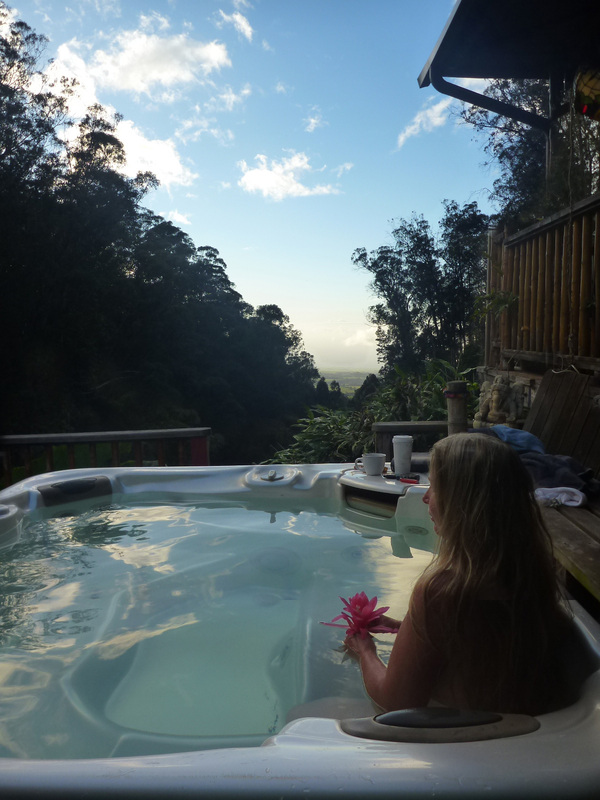 Hot tub fits 6 on a smaller deck & sits over the ravine with a dramatic view to the ocean; perfect for a soak while watching night skies. Lots of storage with a 1063 sq.ft. graveled space under the house (7’ clearance). 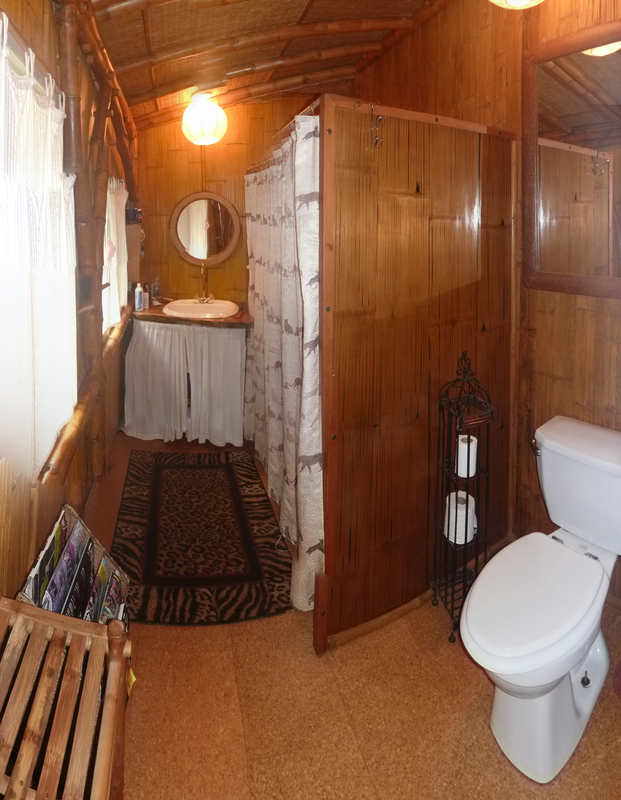 The bathrooms offer you the choice of an oversized shower stall, a cast-iron claw-foot tub, or a copper claw-foot tub from Bali. Separate spaces for a comfortable office, massage or workout room, walk in closets, and built-in shelves. 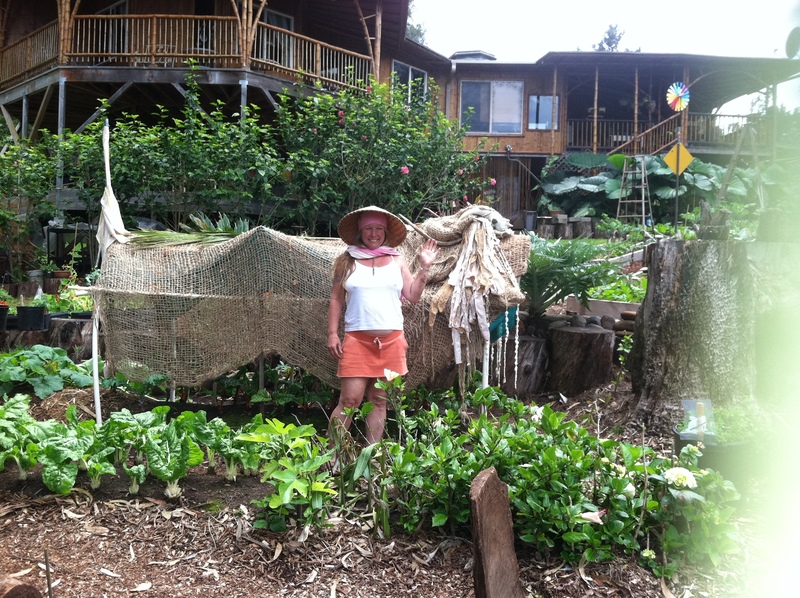 A devoted organic gardener has made raised-bed boxes to grow organic veggies. Here’s a short video tour of the house. This house is a unique achievement of beautiful design, green materials and fine craftsmanship. 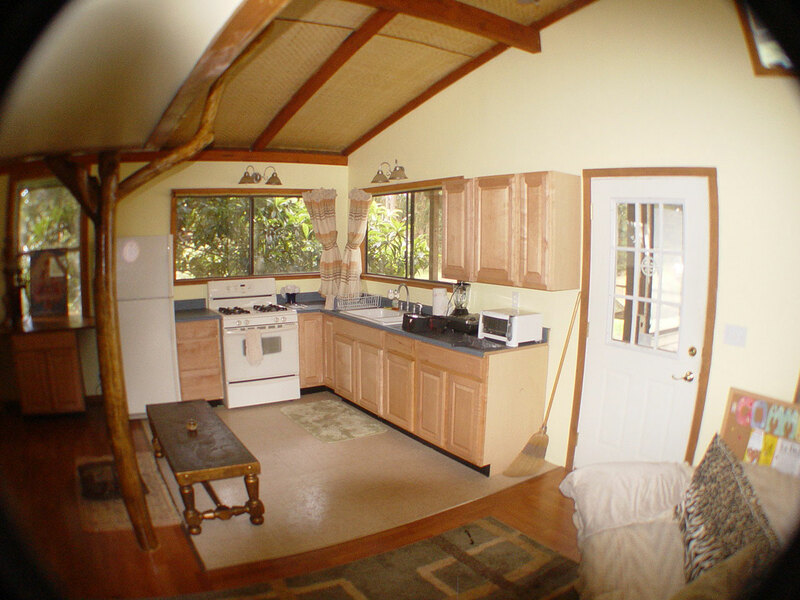 Fully Permitted, Built to Code 2 Bedroom 3 Bath 2126 Sq Ft Interior 1204 Sq Ft of Covered Lanai 633 Sq Ft Covered Partially Enclosed Workshop (Easily Converted to 3rd Bedroom), 208 Sq Ft Partially Covered Outdoor Deck w/ shower 120 Sq Ft Hot Tub Deck w/ 6 Person Hot-tub 1063 Sq Ft Accessible Storage area beneath the house with 7 ft clearance. 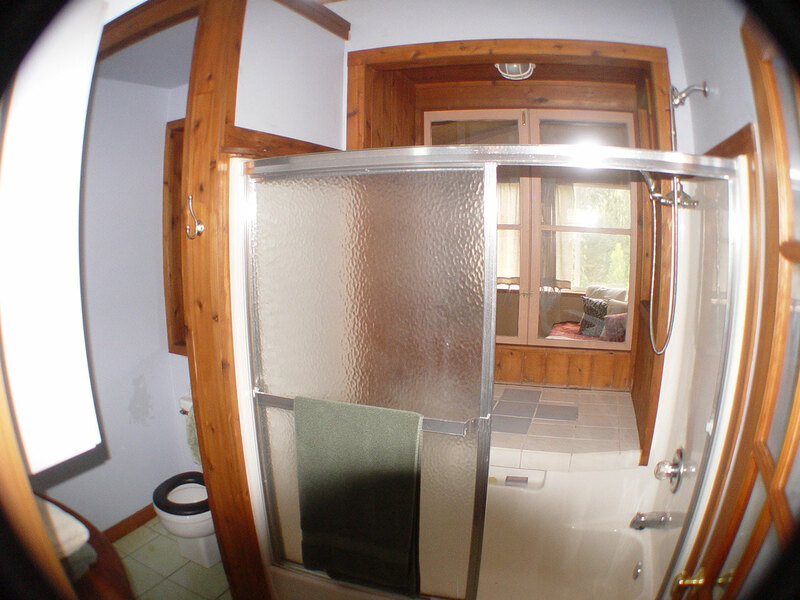 Large Organic Garden Space with Raised Beds Cork and Hardwood Floors * Vaulted Ceilings * Windows All Around Cast Iron Wood Stove *Open Kitchen, Monkypod Counters with Koa Cabinets Skylight in Main Room * Claw Foot Tubs, One Cast Iron, One Copper, Walk in Shower * County Water Meter There’s not a person who’s entered this space who hasn’t commented on how warm and inviting it is. 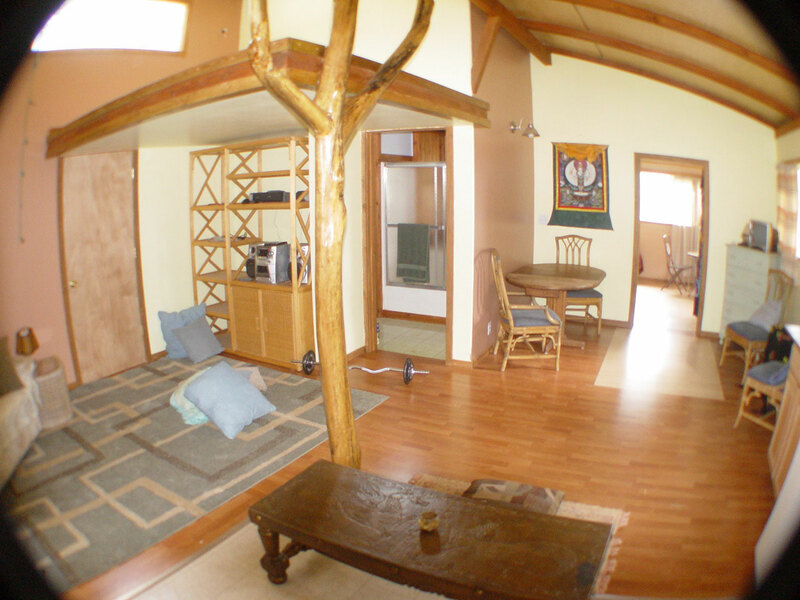 The house was prefabricated in Viet Nam using code-certified structural bamboo by Bamboo Living Homes . It’s a custom installation of three of their hand-crafted buildings — built like fine furniture, extraordinarily sturdy: http://www.bambooliving.com/models-sands-signature-ohana-988sf.html And two 16 ft diameter Ohanas http://www.bambooliving.com/models-sands-signature-ohana-569sf.html with custom built connecting breezeways and additional living areas enclosed. 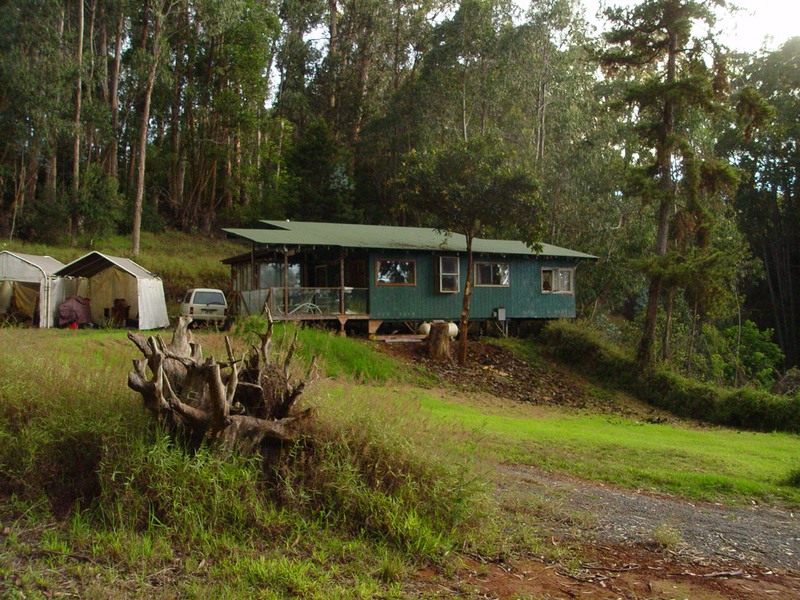 The property is about 3.5 miles up Piiholo rd, above Makawao in Olinda. The elevation around 3200 ft. and the weather here is extraordinarily beautiful. Not as much rain as Haiku and wetter than Kula and Pukalani. 80% of the time ot sunny and in the 70’s, 10% it’s partly cloudy with a gentle mist (Ulalena Rain), Only 10% of the time is actually rainy. Evenings are cool, but never lower that around 53 degrees. “EXOTIC. ORGANIC. LUXURIOUS Dramatic rooflines capture the spirit of the Pacific Rim. Each home in this collection is an object d’arte – crafted, carved and sculpted by artisans with exceptional attention to detail. Breathe in the organic atmosphere and intelligent use of light and space that creates your beautiful, personal sanctuary.” Single wall exterior panels with natural split bamboo siding, coated with Marine Grade Cetol, very low maintenance. Interior wall panels and ceiling covered with woven bamboo with exposed bamboo rafters. 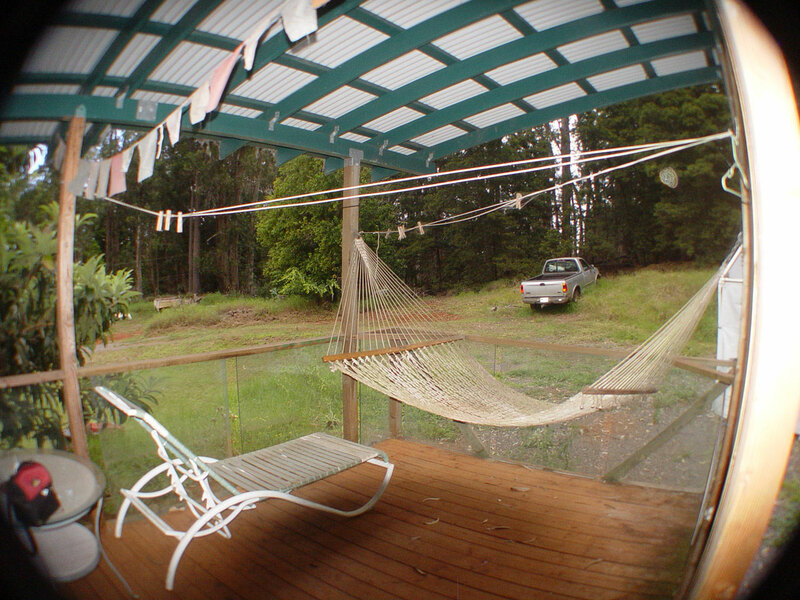 Its all wrapped by 1204 sq ft of covered lanais offering outdoor living space with a great ocean view. The Grand Room has vaulted ceilings, a skylight and is 30 ft across. Its a large 706 sq ft open living space, dining area and kitchen with high-end appliances, Monkypod counters w/ Koa cabinets, a 10’ x 9’ office, a 10’ x 6’ walk-in closet and a 10’ x 6’ bath with large walk-in shower. 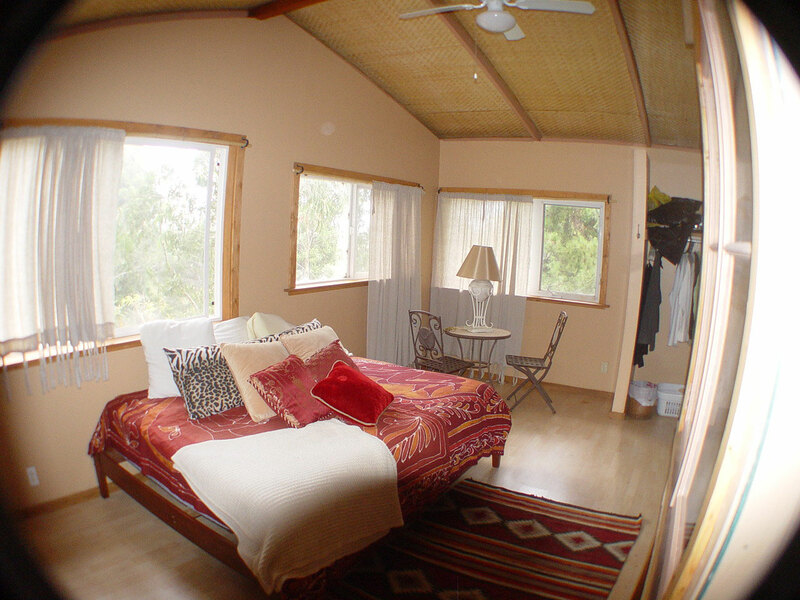 The bedrooms are 16 ft in diameter, around 200 sq ft, also with vaulted ceilings, each with it’s own 6 ft x 9 ft full bath. 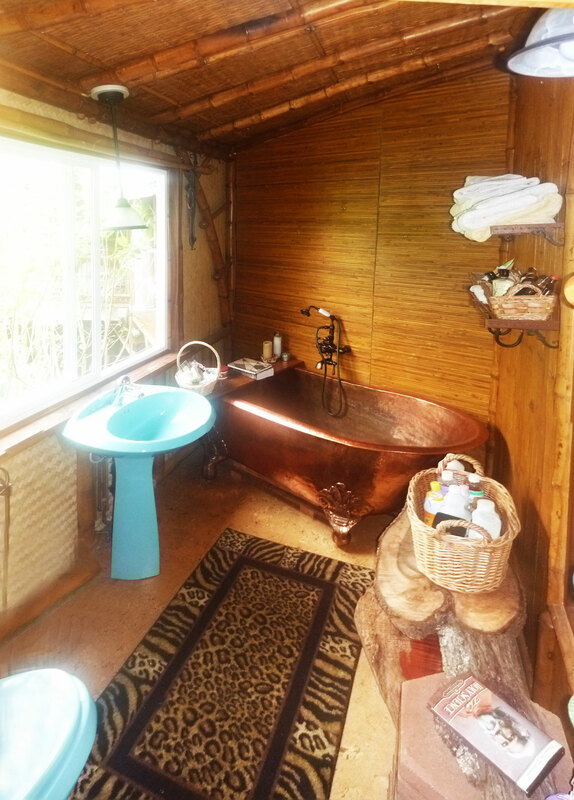 One bath has a cast iron claw foot tub, the other a very special copper tub from Bali and designer fixtures. 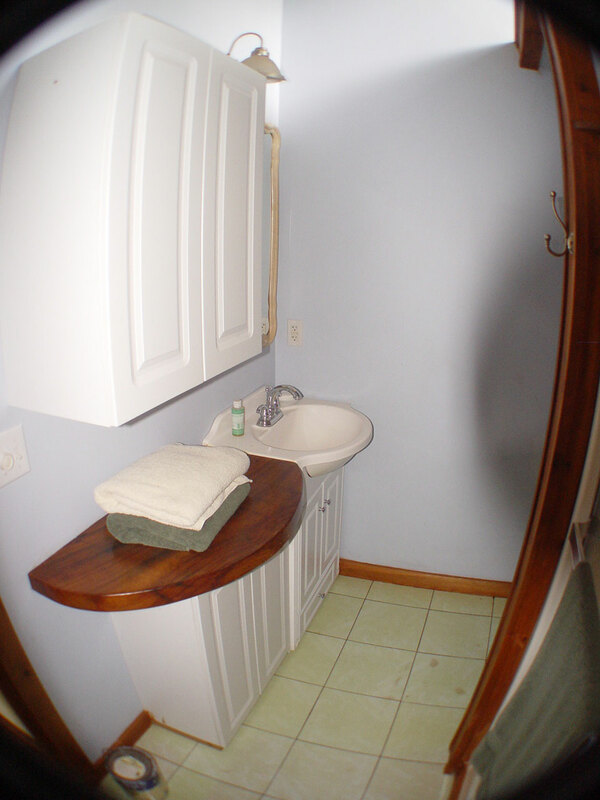 One bedroom has a very large 6 ft x 18 ft walk-in closet and storage area, the other bedroom a 6 ft x 9 ft walk-in closet. All the rooms have an ocean view looking north down to Hookipa. The bedrooms are connected to the Grand Room with expansive, enclosed but windowed breezeways that function as additional rooms themselves, one is 25ft x 12ft, the other 22 ft x 10 ft. The 328 sq ft additional exterior deck space offers outdoor seating, an outdoor shower and a 6 person hot tub, also with an ocean view. There’s also a lower deck, 633 Sq Ft covered, partially enclosed workshop that would easily be converted to 3rd bedroom. 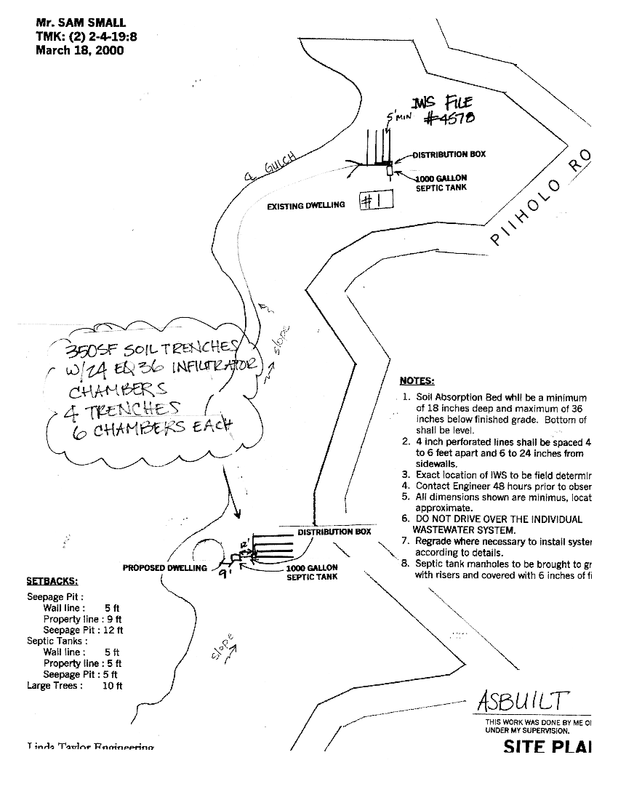 The house is built on deep pilings, pier blocks and tall posts that provide an additional 530 Sq Ft of easily accessible, graveled storage area beneath the house, mostly with 7 ft clearance. There’s a Washer/Dryer downstairs, and a tool bench and workspace. The 5-acre property has a natural separation point, the upper portion, where The Bamboo House is sited, is approx 3 acres. The lower 2- acre portion is well separated from the upper and is where the Ohana is situated. We cleared it of eucalyptus trees so it’s largely open. 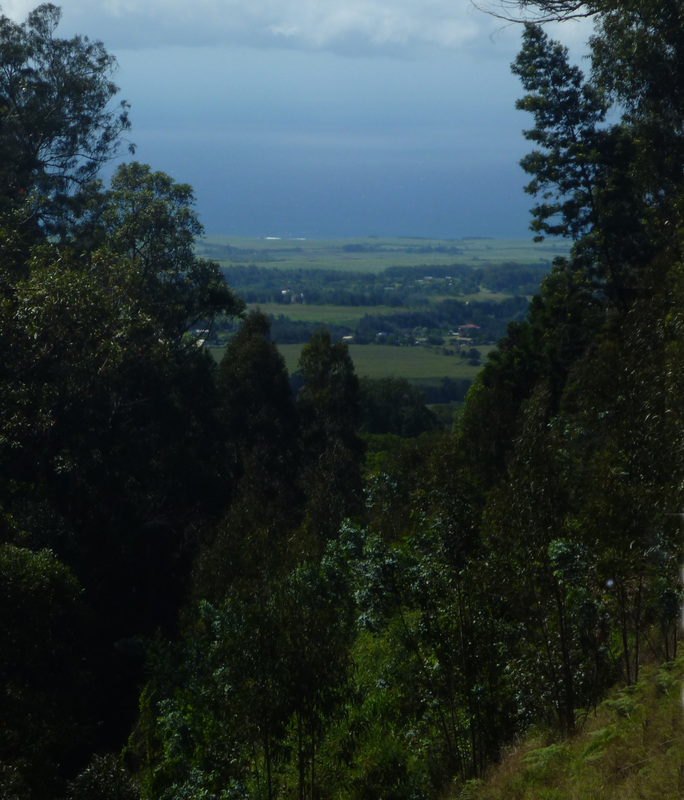 It’s gently sloping, ringed with eucalyptus trees, bordered by Piiholo Rd and a 100 ft deep gulch. 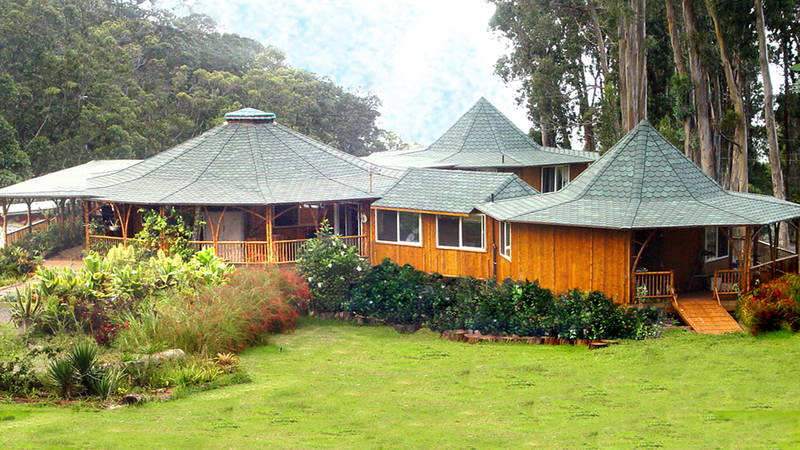 The bamboo house nestles right up to the gulch and the exterior decks extend out over the gulch for great ocean views down towards Ho’okipa, it has a wide-open feel. The entire property is listed for $1,200,000. 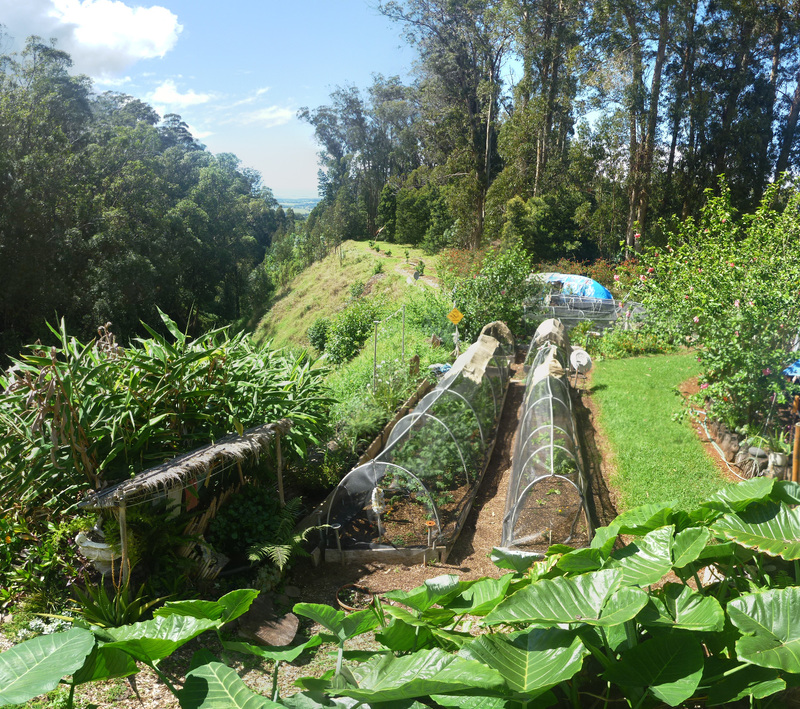 However we would consider selling only the upper 3 acres with the bamboo house for $900,000 and we would retain the lower 2 acres with the Ohana. The property could be condo-minimized (CPR), or a fractional share could be set up, or we could write a lease for us to live in the Ohana – there are several ways we can make it work depending on everyone’s needs. Call Sam Small at (973) 271 0788 to discuss and set up a viewing. Buyer’s brokers welcome and protected. 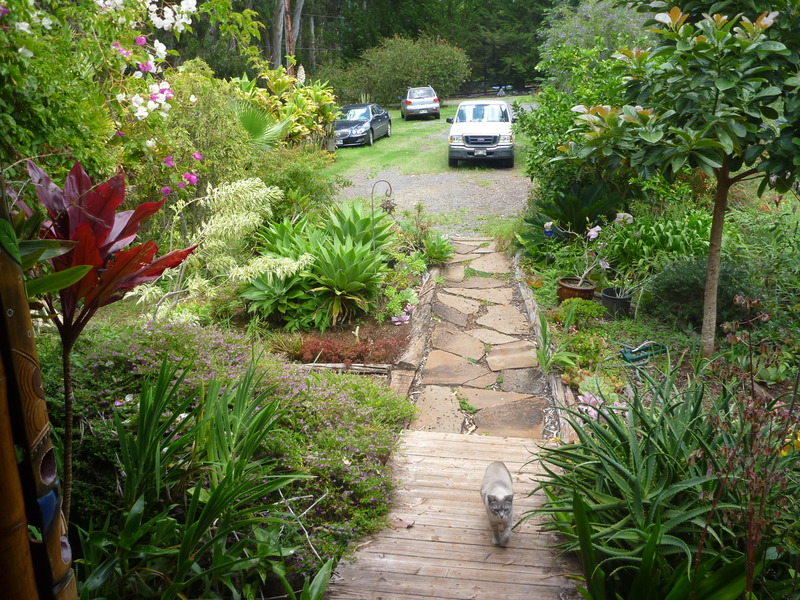 The Ohana at 1818 Piiholo has its own driveway at the far end of the property, well separated from the main house, out of site and sound. 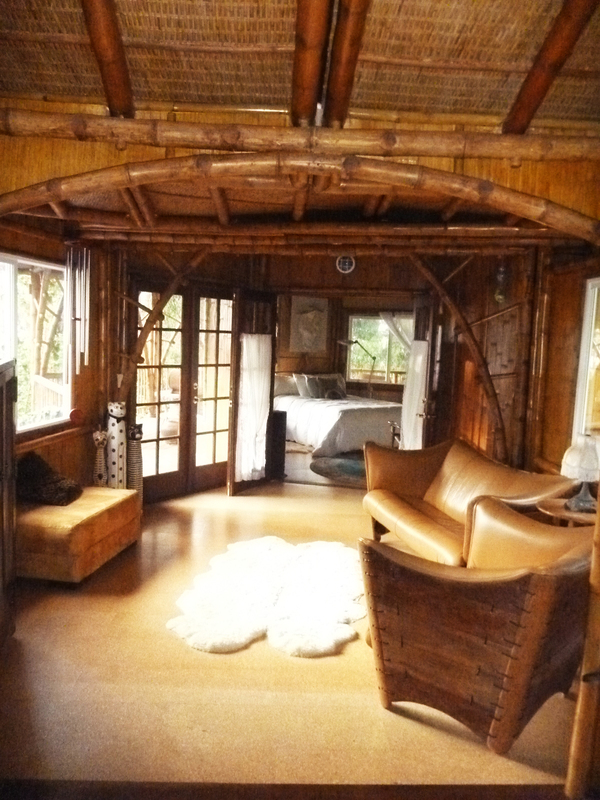 The Ohana is a sweet little cottage that sits in front of two 40 ft retired shipping containers. 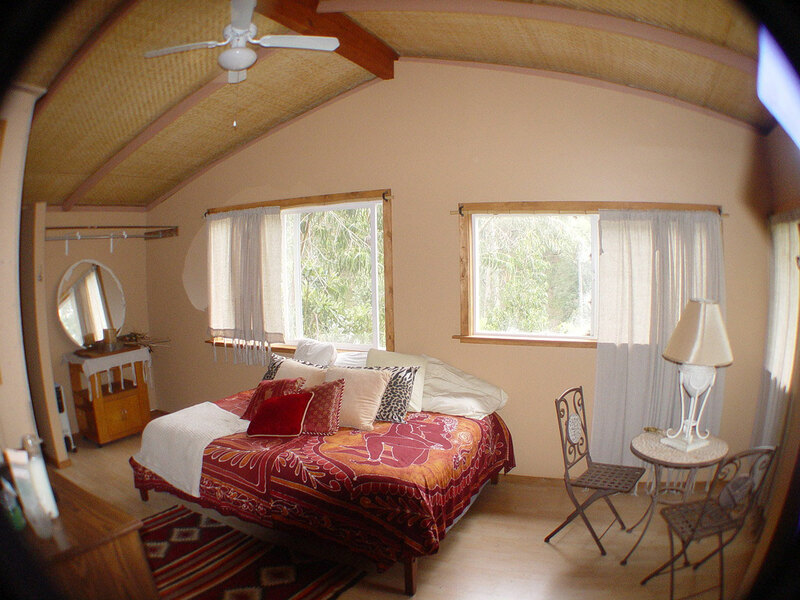 The cottage is around 850 sq ft, 1 bedroom with a sleeping or office loft, 1 bath. It has high ceilings and an open feel. The containers add 720 sq ft of secure storage. One of the containers is open to the house, it makes a great workshop but with a little sprucing could be used as additional living space. 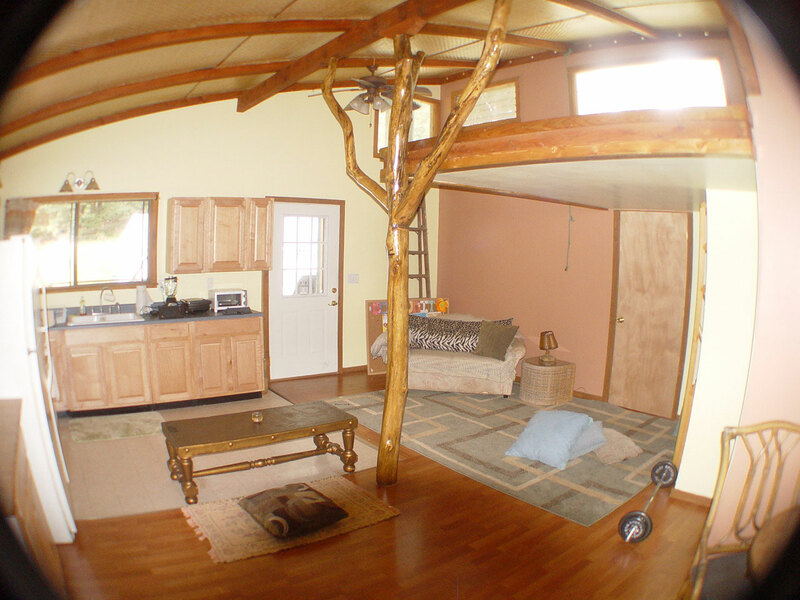 It all has an Arts and Crafts feel, with a tree post in the middle that supports the loft, and makes a sweet living space. Please Share, Help us spread the word!